Guerrilla Games revealed today that Killzone: Shadow Fall will have at least six multiplayer DLC packs. Players can get access to all of them by purchasing the $19.99 Season Pass. The first expansion pack will introduce a new co-op mode. This co-op mode is pretty much Horde mode with Helghast. Four friends must fight off waves of enemies in four arena maps. Over time, players will level up and unlock new items. The three following expansions will introduce more co-op modes. Each expansion includes two more arenas. You'll have to own the initial co-op expansion pack in order to make use of these maps, though. Guerrilla says they'll provide additional details on the last two DLC packs when we're closer to Shadow Fall's launch. They promise that they'll offer hours of additional multiplayer action, though. Shadow Fall's competitive multiplayer (seen in the trailer below) is subjected to less nickel-and-diming. The game will launch with 10 maps for those modes. Furthermore, new maps released after launch will be available to all for free. Although all the co-op DLC costs money, Guerrilla is taking steps to prevent it from fragmenting the player base. Apparently players who haven't bought the expansions will be able to play alongside those who have. They don't quite explain how that's going to work, though. 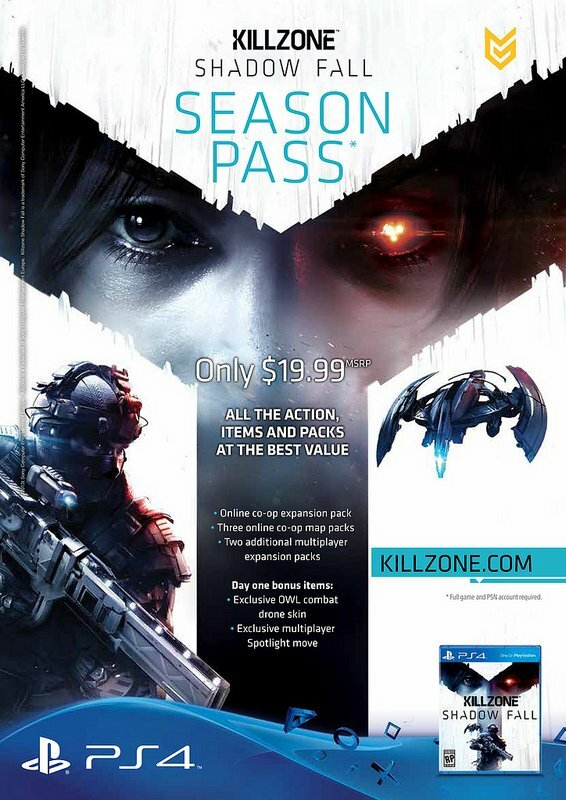 The Shadow Fall Season Pass will also come with a couple extra bonuses. Season Pass owners will have access to an exclusive skin for their OWL combat drone as well as a new Multiplayer Spotlight move. In order to get these perks, though, you'll have to buy it on or before launch day. Shadow Fall's campaign is set 30 years after Killzone 3. The Vektan and Helghast now enjoy a tense truce. Helghast refugees have been resettled in a segregated part of the planet Vekta. However, a shadowy group known as the Black Hand threatens to end the peace and plunge the two sides back into war. Though story sounds broad enough to accommodate DLC, Guerrilla currently has no plans for single-player add-ons. Killzone: Shadow Fall is a launch title for the upcoming PlayStation 4 console. Both the PS4 and Shadow Fall will debut on November 15th in North America and on November 29th in Europe.